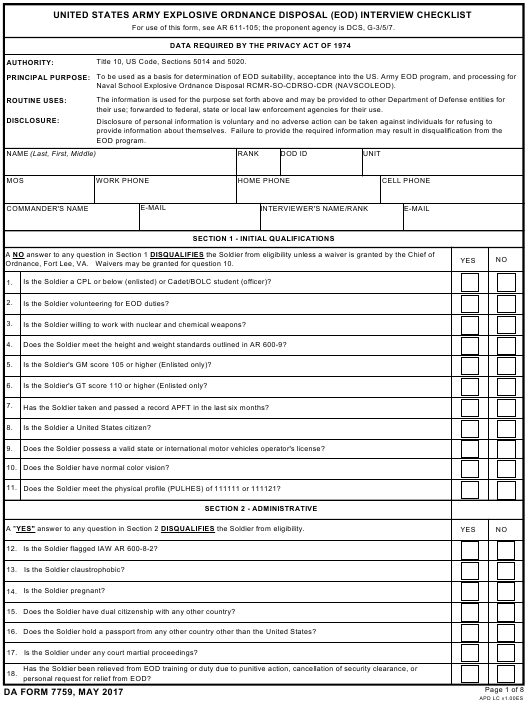 DA Form 7759 - also known as the "United States Army Explosive Ordnance Disposal (eod) Interview Checklist" - is a Military form issued and used by the United States Department of the Army. The form - often mistakenly referred to as the DD form 7759 - was last revised on May 1, 2017. Download an up-to-date fillable PDF version of the DA 7759 below or request a copy through the chain of command. For use of this form, see AR 611-105; the proponent agency is DCS, G-3/5/7. Title 10, US Code, Sections 5014 and 5020. Naval School Explosive Ordnance Disposal RCMR-SO-CDRSO-CDR (NAVSCOLEOD). their use; forwarded to federal, state or local law enforcement agencies for their use. Ordnance, Fort Lee, VA. Waivers may be granted for question 10. Is the Soldier a CPL or below (enlisted) or Cadet/BOLC student (officer)? Is the Soldier volunteering for EOD duties? Is the Soldier willing to work with nuclear and chemical weapons? Does the Soldier meet the height and weight standards outlined in AR 600-9? Is the Soldier's GM score 105 or higher (Enlisted only)? Is the Soldier's GT score 110 or higher (Enlisted only? Has the Soldier taken and passed a record APFT in the last six months? Is the Soldier a United States citizen? Does the Soldier possess a valid state or international motor vehicles operator's license? 10. Does the Soldier have normal color vision? 11. Does the Soldier meet the physical profile (PULHES) of 111111 or 111121? A "YES" answer to any question in Section 2 DISQUALIFIES the Soldier from eligibility. 12. Is the Soldier flagged IAW AR 600-8-2? 13. Is the Soldier claustrophobic? 14. Is the Soldier pregnant? 15. Does the Soldier have dual citizenship with any other country? 16. Does the Soldier hold a passport from any other country other than the United States? 17. Is the Soldier under any court martial proceedings? personal request for relief from EOD? Does the Soldier have lost time (AWOL) under 10 USC 972 within the last two years? 20. Is the Soldier allergic to explosives or petroleum products? Recruiting Team will determine the Soldier's eligibility. Is the Soldier assigned to a unit alerted or on orders for overseas movement? Is the Soldier alerted or on orders for overseas movement? Is the Soldier alerted or on orders for assignment to units alerted for overseas movement? Has the Soldier completed Phase I, Phase II, or Phase III Advanced Leaders course (formerly known as BNCOC)? NCOES technical tract training must complete MOS 89D technical tract training upon completion of the basic EOD course. The Explosive Ordnance Disposal Recruiting team will determine the Soldier's eligibility based on the Soldier's particular situation. 26. Is the Soldier on assignment at this time? If "YES", what is their report date? 27. Did the Soldier ask for or reenlist for this particular assignment? 29. Is the Soldier currently serving overseas? in order to be classed for EOD training. through the Soldier's S-2 office? Alcohol abuse is defined as: the recurring use of alcoholic beverages despite negative consequences. for which they were prescribed. Ordnance Disposal Recruiting team at (910) 432-0884 or (910) 396- 5533 for assistance in determining eligibility. Has the Soldier ever been referred (including self referral) to alcohol counseling? 34. Has the Soldier ever abused prescription medication? Has the Soldier ever been diagnosed with any personality disorder? 38. Has the Soldier been diagnosed with PTSD or a Traumatic Brain Injury (TBI)? Has the Soldier ever threatened or attempted suicide? Does the Soldier have thoughts of suicide? 42. Does the Soldier have thoughts of harming themselves or others? Does the Soldier have a history of irrational fears or phobias? 44. Does the Soldier have any allergies? 46. Does the Soldier have medical problems that interfere with exercise? Has the Soldier received treatment for any injury in the last 6 months? Has the Soldier been under the care of a physician in the past 60 days? Does the Soldier have swollen or painful joints? Does the Soldier have dizziness or fainting spells? 51. Does the Soldier have ear, nose, or throat trouble? Does the Soldier have lung or respiratory problems? 53. Has the Soldier ever had a head injury? Has the Soldier ever had heart trouble? 55. Has the Soldier ever had stomach or gall bladder problems?